Plants in the family Myrtaceae, in particular species of Eucalyptus, have high leaf concentrations of essential oils, mainly mono- and sesquiterpenes. Monoterpenes are generally toxic to insects without specific defence against them. Although there is little direct evidence that eucalypts and paperbarks are protected by the oils themselves, these plants are not frequently attacked by local herbivores when planted outside Australia, and are said to be highly resistant to such insects. 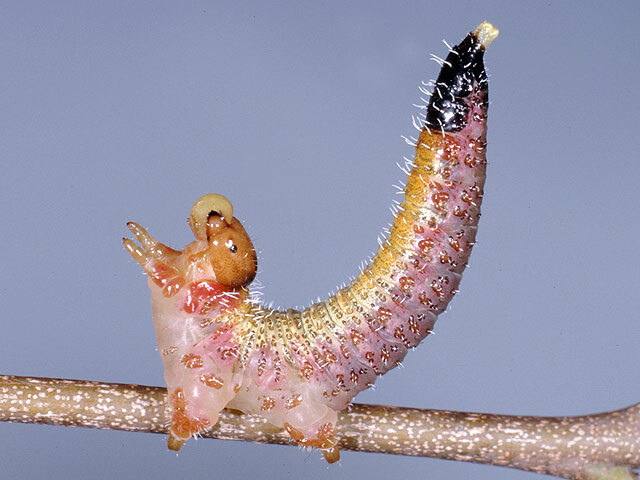 Larva of Acanthoperga cameronii. The diverticulum filled with orange-coloured eucalypt oil is clearly discernible in the thoracic region. Phytophagous insects that feed on oil-rich Myrtaceae have developed specific mechanisms to deal with these oils, some of which are notoriously toxic (e.g. 1,8-cineole). 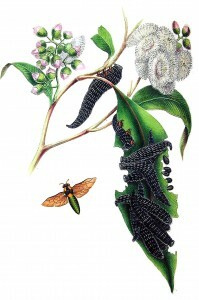 Some of the eight Australian subfamilies in the sawfly family Pergidae are associated exclusively with Eucalyptus and Melaleuca species that often have high concentrations of essential oils. The Perginae, one of three Australian pergid subfamilies, radiated almost exclusively on myrtaceous hosts and thus are exposed to high concentrations of essential oils in their host plants. The larvae sequester the oils from their diet and the oil is stored in paired sac-like extensions of the foregut (so-called diverticula) and used for defense purposes when disturbed. The full diverticulum can reach up to 20% of the body mass in final instar larvae. Cluster of Pergagrapta polita larvae. 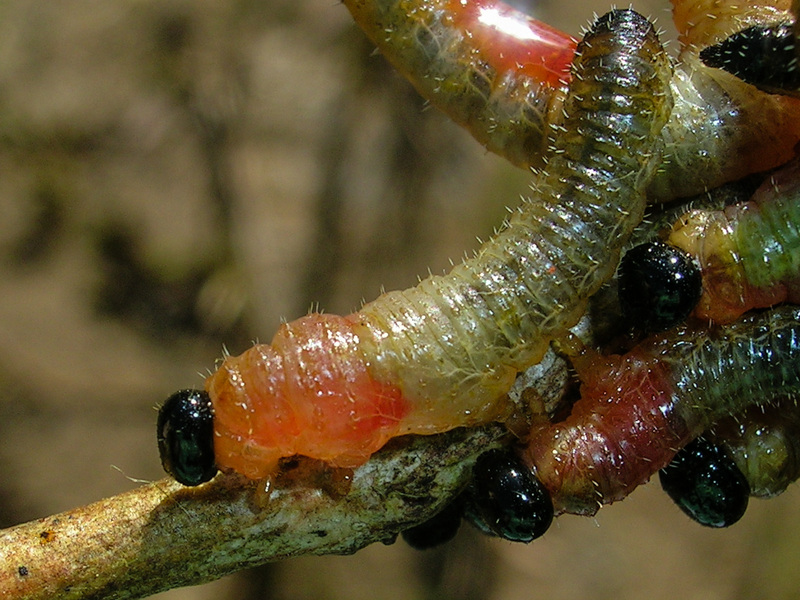 During daylight hours larvae remain in a cluster surrounding a branch. When disturbed, larvae within a group simultaneously raise the head and tail, and regurgitate the contents of the diverticulum, often applying some exudate to their own abdomen and to other larvae nearby. When the disturbance ends, larvae slowly reabsorb the exudate into their mouth. 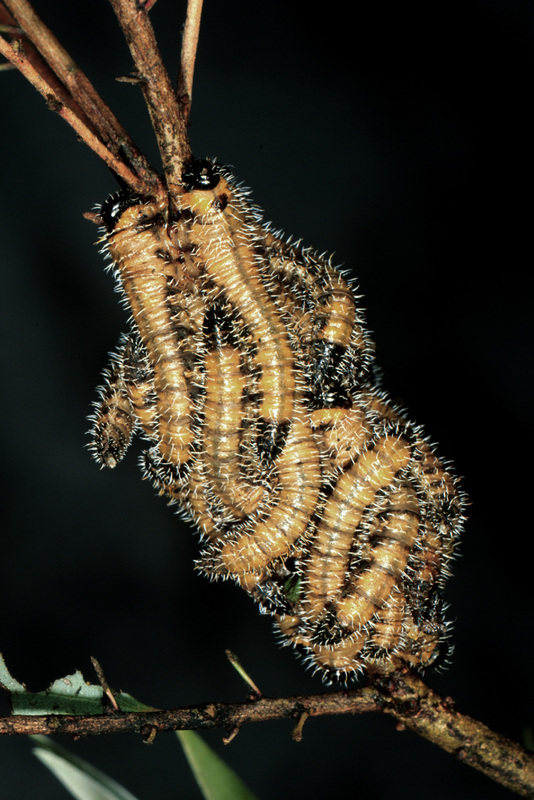 Because of their defence behaviour, the larvae of Perginae are in Australia also known as “spitfire grubs”. Defence reaction of Pergagrapta polita larva. When disturbed, larvae exudate a fluid from their mouth trying to apply it to their enemy. Behavioural observations and field studies show that the pharyngeal diverticulum is at least partially cleared periodically by means of regurgitation. In the laboratory larvae sometimes regurgitated exudate with their head directed downwards, even though they were not disturbed and showed no sign of agitation. Such regurgitation was almost invariably observed just prior to larvae feeding at night. The larvae produced much larger droplets during this behaviour than during their defence reaction, and they allowed the regurgitate to drop to the ground. The separation and regurgitation of oils is therefore presumably a mechanism by which pergid larvae eliminate host-associated oils from their diet, apparently to reduce the toxicity of their food plant. 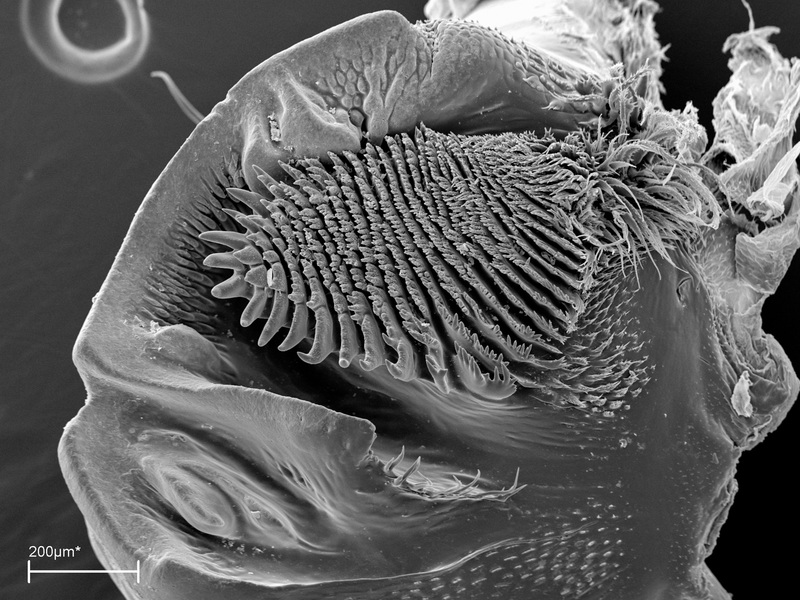 Larvae of the subfamily Perginae have a soft brush-like structure on the inner surface of their mandibles that is unique among phytophagous insects, and which is used for separating oils from the leaf material they ingest. Internally the scopa has a mesh-like structure that is very distinct from the strongly sclerotized, hard parts of the mandible. Each scopa consists of a large number of branched setaceous protuberances of the cuticle which give it their brush-like appearance (see images below). Schmidt, S., McKinnon, A.E., Moore, C.J. & Walter, G.H. (2010) Chemical detoxification vs mechanical removal of host plant toxins in Eucalyptus feeding sawfly larvae (Hymenoptera: Pergidae). Journal of Insect Physiology 56, 1770–6. Schmidt, S. & Walter, G.H. (2011) Adapting to cope with eucalypt oils: Mandibular extensions in pergid sawfly larvae and potential preadaptations in its sister family Argidae (Insecta, Hymenoptera, Symphyta). Journal of Morphology 272, 1314–24.